Celebrate the State of Oklahoma centennial in 2007 with an instrumental arrangement of your favorite OKLAHOMA! melodies by Richard Rodgers. Choose from the OKLAHOMA! OVERTURE (film or stage version, 5 minutes, arr. by Robert Russell Bennett), SELECTIONS FOR ORCHESTRA (11 minutes, arr. by Robert Russell Bennett) and the OKLAHOMA! SUITE (26 minutes, arranged by Morton Gould), to compliment any exciting concert event. These classic arrangements include timeless songs like People Will Say Were In Love, Oh, What a Beautiful Mornin, The Farmer and the Cowman and of course, the title song and official state song, Oklahoma. Revisit SHOW BOAT, the Hammerstein and Kern musical masterpiece. 2007 marks the 80th anniversary of this landmark musical, and what better way to celebrate it than with a tune that keeps on rollin through the decades. 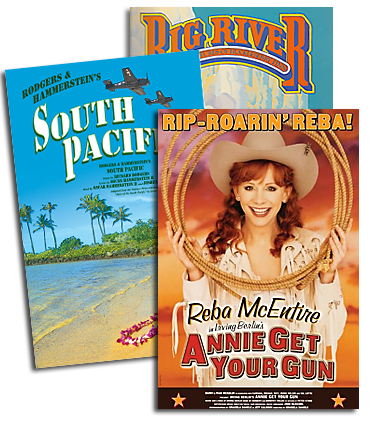 The R&H Concert Library features four instrumental pieces to suit any concert event: the original 1927 SHOW BOAT OVERTURE (4 minutes, arr. by Robert Russell Bennett); the symphonic SHOW BOAT OVERTURE (4 minutes, arr. by Robert Russell Bennett); SYMPHONIC SELECTIONS FROM SHOW BOAT (11 minutes, arr. by Robert Russell Bennett); and SCENARIO FOR ORCHESTRA [Themes from SHOW BOAT] (22 minutes, arr. by Charles Miller). Songs from this classic show include: Cant Help Lovin Dat Man, Make Believe, Why Do I Love You? and Ol Man River. Long live the King! This year we celebrate the 50th Anniversary of the acclaimed movie version of THE KING AND I. Starring Deborah Kerr and Yul Brynner, the film is given the full DVD deluxe two-disc treatment by 20th Century Fox Home Entertainment. Winner of five Academy Awards in 1956 including Best Scoring for a Musical Film (given to Alfred Newman and Ken Darby), THE KING AND I sounds as spectacular as it looks. The R&H Concert Library is proud to offer selections from this score drawn from the actual film orchestrations.